At Lege Artis® we believe that our extensive medical background together with the advanced technology can deliver the optimal results. Clients with rosacea have now the benefits of the laser system world-recognized as the "Gold Standard" for the treatment of skin redness and a wide variety of vascular skin conditions. Candela's Vbeam pulsed dye laser has a more than a 20-year proven track record of safety, reliability and efficacy for treatment of a wide range of vascular conditions. Vbeam laser is gentle enough and safe for use on infants as young as a few weeks old, yet powerful enough to address most adult skin problems. Vbeam laser is considered worldwide as the "Gold Standard" in treating vascular skin problems, including rosacea, spider veins and facial thread veins, red post-acne scars, and diffuse skin redness. Pulsed Dye Lasers deliver an intense but gentle burst of light into selectively targeted areas of the skin. The light is absorbed by specific blood vessels in the dermis depending on the condition being treated. Factors such as the age, colour and type of lesions, as well as the location on the body, all determine whether lesions can be removed. I am the right candidate? Most clients who receive cosmetic laser treatment decide to correct their skin condition not out of medical necessity, but because they would like to improve the appearance of their skin without invasive surgery that would cause downtime away from daily activities. The treatment goal can range from a total facial rejuvenation which involves the reduction and removal of red and brown pigmented lesions with a general firming of the skin, to the removal of smaller localized imperfections. The feeling most clients report is a tingling sensation during a treatment. The skin being treated is additionally protected by Candela's dynamic cooling device, DCD, which delivers a cooling mist on to the skin immediately before the laser pulse is emitted. This cooling mist increases comfort during V-beam Laser treatment and protects the skin to minimize side effects like redness. Most clients notice improvement after their first session, and often times feel a firming or tightening of the treated area. The results of laser therapy vary depending on the condition that is being treated and the number of treatments required for clearance. Due to the nature of the human body it may take several treatments for the optimal improvement. For vessels, they may need to be shrunk over a number of treatments. And wrinkle treatments are a result of the laser stimulating the body to produce or reorganize collagen. Some clients experience redness or mild swelling in the treated area immediately following treatment, this usually goes away in a few hours. Occasionally purpura, a laser bruise, may occur. Purpura is a reaction caused by laser energy entering a blood vessel in a rapid fashion thereby rupturing the vessel allowing blood to escape creating the bruise. Purpura is transient and usually disappears in three to five days. Avoid sun exposure for at least two weeks before treatment and wear a sunblock of SPF 30 or higher daily. Avoid exercise on the day of your treatment and for 5 days after the treatment of leg veins. Avoid hot baths and excessively hot showers, steam rooms, hot yoga or sauna for 5 days after the treatment. Medications or herbal supplements such as ibuprofen (Advil), aspirin, vitamin E, fish oils and alcoholic beverages thin the blood which can result in purpura. Retinoids, hydroquinone, alcohol- and acid-containing skin care products (including AHA, BHA, L-ascorbic acid - an acidic type of vitamin C) should also be ceased 1 week before and after laser treatment. Do not wax or thread the treatment area for at least 1 week before and after laser treatment. Clients who took Accutane should wait at least 6 months prior to laser treatments. The treatment can not be performed if a client arrives feeling unwell, having symptom of a cold/flue, fever, presenting with a cold sore or shingles. Post treatment care guidelines depend on the condition treated, and should be discussed with your Vbeam laser practitioner. The frequency of the treatments will depend on the problem treated. In general, treatments are scheduled every 4 to 6 weeks apart. Can I have a Vbeam laser treatment and another treatment on the same day? It is advisable that your laser treatments be performed separately from other treatments, such as microdermabrasion or chemical peels. Also, if the same area has different problems (such as pigmented spot and redness or rosacea at the same time), those problems should be addressed individually and on separated days - 1-2 weeks apart. ​V-beam Laser Therapy for spider veins on the nose. Photos before and 1 month after the 2nd treatment. (c) Lege Artis. ​Post acne scar smoothening - result after one Vbeam laser treatment. (c) Lege Artis. 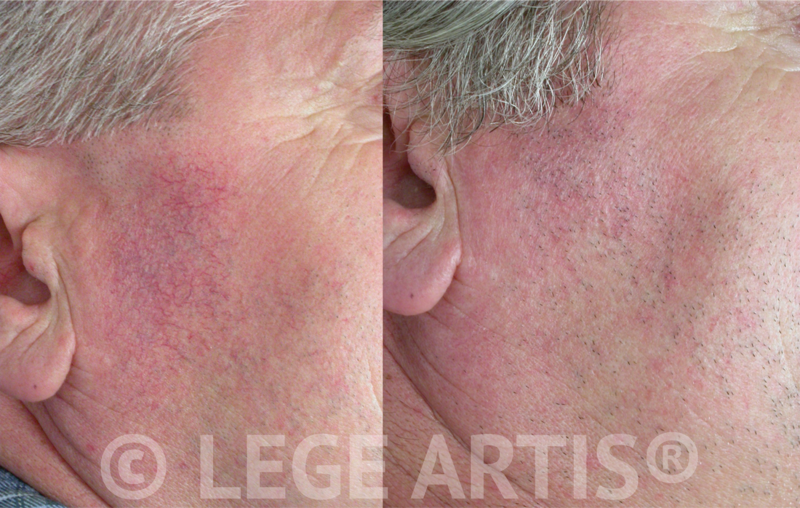 ​Face redness, rosacea, thread veins removal - results after three Vbeam laser treatments. (c) Lege Artis. ​Same client, right side view. 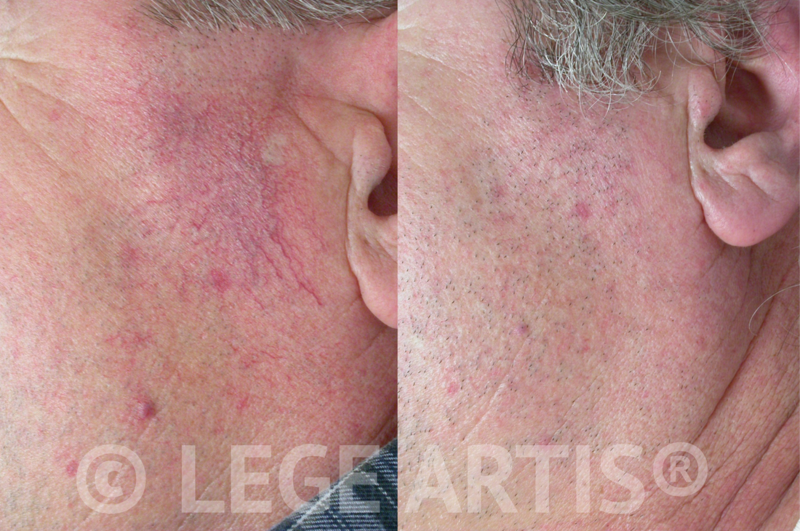 Face redness, rosacea and thread veins removal - results after three Vbeam laser treatments. (c) Lege Artis. ​Nose thread veins and skin redness reduction - results after three Vbeam laser treatments. (c) Lege Artis. Nose thread veins and skin redness reduction - results after three Vbeam laser treatments. (c) Lege Artis.